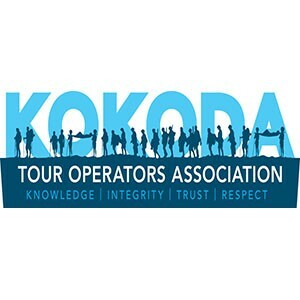 The T8 trek kicked off when ETA staff met our 4 keen trekkers at the airport, we then took the shuttle to the Ela Beach Hotel and everyone got settled in their rooms, and prepared for the adventure to start the next morning. The next day we met Andy, Soddy and some of our other porters at the hotel. We then drove the dustry Port Moresby roads to Bomana War Cemetery to pay our respects and have a solemn moment before the ruggedness of the Kokoda Track. We then started the steep drive up to Owers Corner to start our first day of trekking, but not before meeting the rest of our porters (not forgetting the Buna Boys! ), sharing some history and taking some photos. Our first camp for the trek was at Goodwater campsite. We got into camp early enough to enjoy some time relaxing in the afternoon and learning more about each other and why we were here doing the Kokoda Track. Ioribaiwa was our destination for the next day, after climbing Imita Ridge, everyone was ready for some morning tea on the other side, where we all quickly learned how much Andre loves his food! From Ioribaiwa we trekked up towards New Nauro, but not before passing some amazingly huge spider webs. The Nauro shower is always a welcome site after a long day trekking, but Kathryn got to experience first hand to “expect the unexpected” when the water ran out! From Nauro we trekked down through the swamps near Agulogo, and it was then “boots off!” to cross Brown River. After Agu, we started the intense climb up The Wall, then were treated to some spectacular views from the Menari Saddle. We arrived at camp in Menari, and quickly learned how much Andre loves his “traditional” PNG snack of coke and twisties! The next day we started out by climbing up to Brigade Hill, sharing some history and then back down the other side,past Nishimura’s Tree, then down through Efogi 1. We trekked up to Efogi 2 for lunch, then upwards to Naduri through some lovely village PNG gardens while getting dumped on by some heavy rain! Despite the cold rain, the trekkers still braved the even more freezing cold showers in Naduri! After leaving Naduri in the morning, we headed up through the Moss Forest towards the ridge of Mt. Bellamy, the highest point on the track, but not before visiting Small Myola where the Aussie’s air dropped supplies, and checking out the crashed B25 Mitchell at Bombers Camp. From there it was on to Templetons Crossing for camp, where the water is freezing but the fires burned nice and hot! From camp we headed towards Eora Creek, where we visited the Aussie weapons dump (grenades and mortars) and the Japanese mountain gun position. The it was on to Alola for lunch, where we were treated to some more amazing views while enjoying some local fruits and veggies. From Alola we started the trek towards camp at Isurava battle site, but not before seeing the devastating effects of some huge landslides that happened a few weeks earlier. It was up early the next morning for our Dawn Service, which was an emotional time of reflection for all the trekkers, but before long we’ve had our breakfast and are heading down towards Hoi Village, where the picturesque location and cool flowing creek always bring a sigh of relief from the weary trekkers. 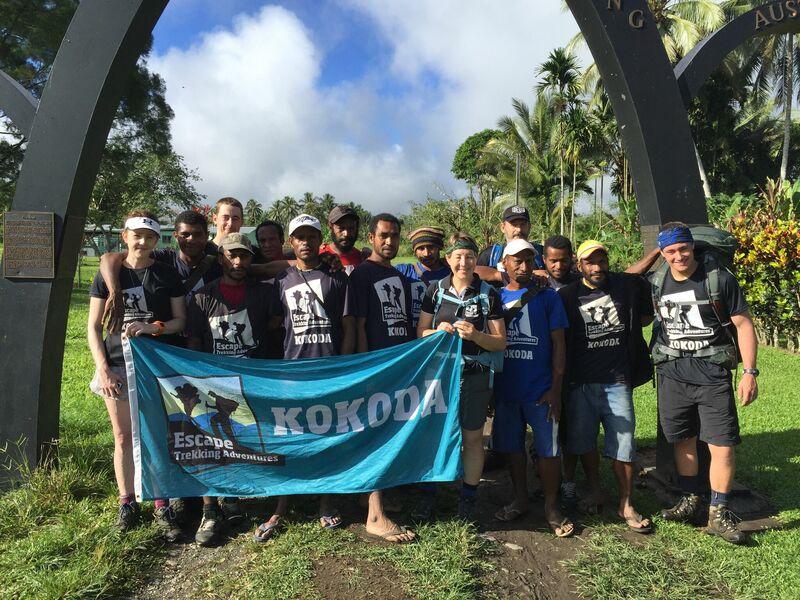 It was not long from Hoi the next day when we arrived finally at Kokoda Station, where it’s hugs, high-fives and handshakes all around! But the adventures didn’t stop there, as before long we’re all on a PMV truck heading towards Gona to catch a ‘banana boat’ to Buna, but not before stopping off at Sanananda and visiting the local war museum. mind you, we were all completely soaked, except of course for Malcolm, who managed to score the best seat on the boat, where he only sustained a few drops and splashes from the rough seas! At Buna we were treated to a traditional Oro Province welcome, and the trekkers were shown to their rooms in the huge guesthouse hut. Buna was a great time for all trekkers to unwind after a long trek, and much time was spent relaxing and reading and debriefing. But it wouldn’t be a Buna trip without trek guide Nathanael climbing some coconut trees for the “How To Enjoy A Coconut” demonstration! Nicole seemed to enjoy the fresh coconut water, and Kathryn felt like she was on the show Survivor! But all good things eventually come to an end and we were on the truck back to Girua Airport, to catch our flight back to Port Moresby. Once at the Ela Beach Hotel, the trekkers got settled and all cleaned up before enjoying our last meal and debrief of the “Highs and Lows” of the entire trek, before our flights home the next day back to Australia. A great time was had by all trekkers, and we were all grateful for minimal injuries, and maximum adventure!